For my B-day Mardi and I went to Kauai for a nice 8 day rest and recharge, Got back to snow and a fallen 80′ tree that took out part of the back dog wire fence while we were away. Good thing we invested in a STIHL chain saw. Came in handy for Nick to clear the tree from the fence line so the dog wire could be secured to keep Ellie from escaping her area. On Sunday Feb. 25 ran the chipper for about 2 hours and almost completely cleared the debris from the Green House pile. Just in time to start on all the fallen tree branches. Ordered a new set of chipper blades from Power King. only like $23.00 each. Hopefully will ship so I can run some material this weekend. The chipper ate a rock and is now is not cutting, basically smokes and nothing gets passed through. So new blades are the only solution. We see about sharpening this blade. 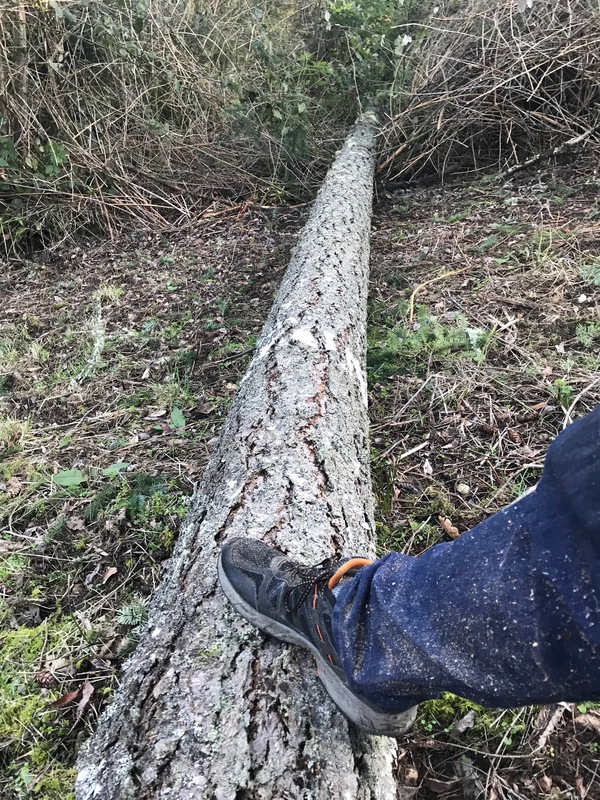 Went to cut up the fallen tree. Took about 90 minutes with the chain saw to get the trunk and branches cut up so we can get into the area, Now we have room to move and can replace and tightening up that section of dog wire fence. The fence was put in Nov 15th so in less than 4 months needs to be fixed. Go figure. Mardi has become very concerned about other trees falling in a wind storm, probably with good reason. This tree was standing all alone in the leach field, and not sure but it looks like it was trimmed to remove some branches to keep it from becoming a wind sail. But the job was poorly done and left the branches as torn not cut which might have weakened the tree. This tree had zero roots to stabilize it from the wind direction. The one root was healthy but had termite damage around it. Thinking of make a totem pole out of the tree. Get a tracked back hoe and drag it down to outside the studio. Make a Chinese new year of all the families animals. on it. Who knows. 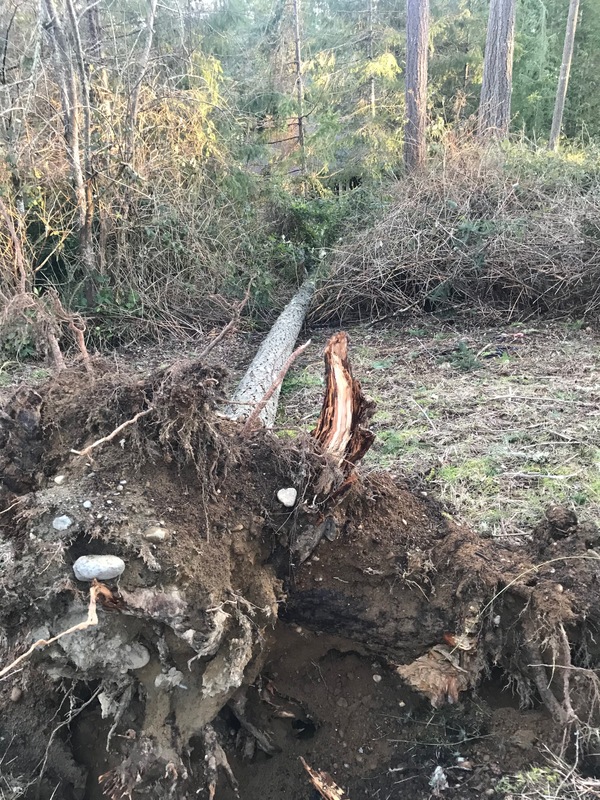 The PWN and this property is different than another we have had in less than 4 months have had 2 trees come down that I needed to to deal with. The first was a small birch about 40′ tall then this one, a 80′ pine tree. Starting a collection of logs from these two. All in all we have tons of down trees of all shapes and sizes. Some by nature the others by man to clear out the forest so the original owners could have sunlight on the back yard. We just have a lot of property and forest and blackberries and things to do.